Active shooter situations often start and end quickly – generally about 10 to 15 minutes elapse between the start of an event and when law enforcement arrives. For this reason, mental and physical preparation are key. 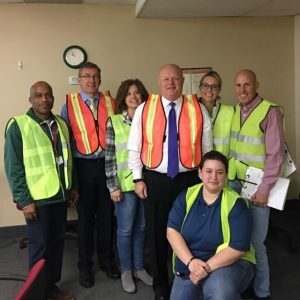 Earlier this month, NACHC partnered with Black Hawk Emergency Management Group, LLC, an organization specializing in disaster prevention and emergency management consulting, to provide an active killer/active shooter response training and exercise drill to the staff at Trillium Health in Rochester, NY. The presentation was part of an on-site direct technical assistance engagement made possible by a National Cooperative Agreement between NACHC and HRSA’s Bureau of Primary Health Care. The health center requested the training to help educate staff on the actions to take should an active shooter event take place during health center operating hours. Trillium has invested considerable time and resources in training staff around emergency management practices (including emergency disaster need assistance) over the past several years. Still, there has been an increase in the number of threats against the health center, and at least two situations in which patients brought weapons on-site. Faced with these challenges, Trillium leadership recognized there was an urgent need to provide staff increased confidence in emergency management procedures and planning, knowledge of emergency response procedures and best practices, and training on successful response to emergency preparedness drills. The session, Active Shooter (Run-Hide-Fight) 101, was broken into two parts: (1) a 30-minute classroom-style training that covered the distinction between incident types and provided case study scenarios with follow-up action steps, and key terminology; and (2) a simulated drill exercise where staff applied what they learned in “real-world” scenarios at their own work stations. Each active shooter drill began with a text message alerting staff to an active shooter situation on the premises and the location of the shooter. Staff were expected to make decisions based upon the response options presented during the classroom session (Run-Hide-Fight), information received related to the shooter, and their personal plan. Members of the training planning team helped conduct the drill activities and acted as controller/evaluators (dressed in orange or yellow vests), either controlling staff movement with orange cones designed to block normal exit areas or monitoring/evaluating their decisions and actions. Upon receipt of the text message, staff had to take appropriate action as soon as possible. If a chosen route was blocked, they had to stop and remain there. At this point exercise controllers had the option to ask them questions about their decision-making process. During the debrief, staff shared their thoughts about what went well and what they felt could be improved. Primarily, staff welcomed the training and exercise as it was timely and necessary. They felt the training was beneficial in preparing them to respond to an active shooter/active killer situation and that both the training and the exercise provided stimuli for further discussion. Moreover, the active engagement and enthusiasm demonstrated by staff participation provided evidence that the objectives of the training and exercise drills were met. Participants were able to effectively distinguish between active offender types, recall action steps, define key terminology, and apply lessons learned from the training and exercise drill. Both the health center planning team and Black Hawk Emergency Management Group were encouraged by this feedback from health center staff, and are looking forward to further supplemental activities and collaborations with staff and partners around this topic. For more about NACHC’s Training and Technical Assistance offerings, contact Sherry Giles at trainings@nachc.org. For additional resources on health center operations, visit the Health Center Resource Clearinghouse at www.healthcenterinfo.org.